Beef the dog (seen here with his human, Chris Clark) has donated blood at the VMC more than 50 times. If Beef was a human being, he’d likely be getting a letter of recognition from Canadian Blood Services. 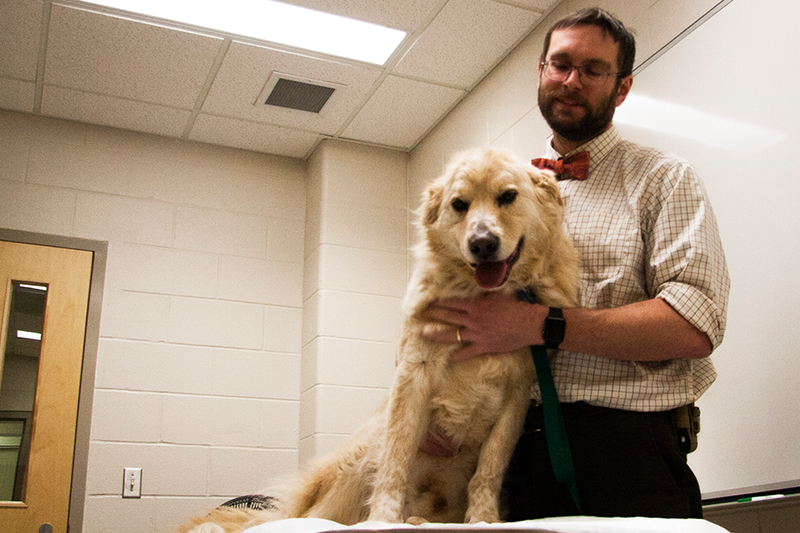 Instead, his contributions are rewarded mostly by treats and affection from the staff at the Western College of Veterinary Medicine's (WCVM) Veterinary Medical Centre (VMC). For years, Beef—a friendly, mixed-breed dog of what's likely maremma and golden retriever origins—has provided a life-saving service, donating about half a litre of blood on a monthly basis. By 6:30 am on the morning of his 54th donation, Beef was pawing at the door of the treatment room waiting to get started. "It's the highlight of his month," says his owner Chris Clark, an associate professor of large animal medicine at the WCVM and the college's acting associate dean, academic. Nine-year-old Beef is a (DEA) 1.1 negative donor—the "universal donor" of the dog world. This is similar to the O-negative blood type in humans. It's the most sought after blood type, because similarly to people, it can be used for dogs with any blood type. Blood donations typically come from animals owned by faculty or staff and are used only for VMC patients. About 10 minutes after he made his donation, veterinarians used Beef's blood to support a dog going into surgery. The ideal VMC canine blood donors are healthy, medium- or large-sized dogs that weigh at least 50 pounds and are between one and a half to seven years of age. The dogs must also be good natured. Cats can donate blood as well, but the need is less frequent.